Join the teams after the finals of the East Coast Open Women's Championship for a field-side dinner and after-party to celebrate the hard-fought victory. 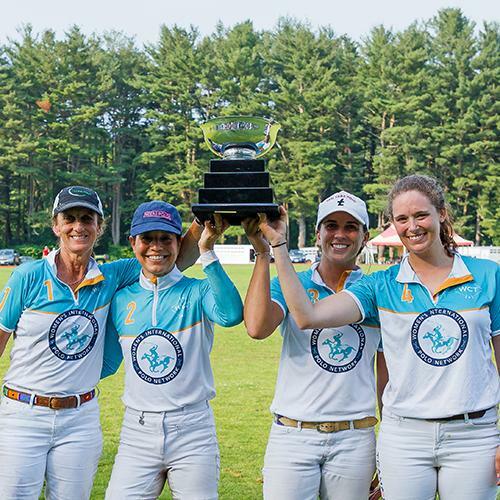 The tournament, inaugurated by Newport Polo in 2018, features the top female polo players from around the world competing in a week-long series of matches, culminating in the Final as the featured match of the Newport International Polo Series on Saturday, Jun 29th. Take part in the meet & greet with the players, then enjoy a buffet dinner under the starts. Menu and tickets to be announced. Tickets* TBA quantity limited, by advanced reservation until sold out. Cash bar. Catered fieldside. Polo match tickets sold separately. *Must present ticket at the buffet; Tickets are for individual dinner portions per person. This is NOT an unlimited buffet. Buffet closes promptly at 8PM. Refunds must be requested in writing by the customer, via email, at least 7 days prior to the ticketed event (by noon on the previous Friday) sent to: agnes@nptpolo.com. RAIN DATE: In the event of the postponement of the June 29th polo match prior to its start, (due to weather/field conditions), the Après Polo dinner will be postponed along with the match to the following day, Sunday June 30th, at the same time. All original dinner reservations will be transferred to the rain date. For more details on our ticket policies, please follow this link. In the event of inclement weather, always check the Match Status recording on our Info Hotline (401) 846-0200 x2 and our website, nptpolo.com for Alerts, both of which are updated with any status change for the impending match.